COLORADOSPRINGS, Colorado - Japan is building upon its past successes in space to forgea range of initiatives, from disaster warning systems, probes to Mercury, Venusand Jupiter, as well as conduct an aggressive lunar exploration campaign. KaoruMamiya, Vice President, Japan Aerospace Exploration Agency (JAXA) outlined hiscountry's long-term space plans, speaking here at the 23rd National SpaceSymposium produced by the Space Foundation. Mamiyadetailed recent major accomplishments, such as last year's launchof the Advanced Land Observing Satellite called Daichi - meaning Terra. "Itis operating smoothly and producing significant amounts of observing data," hesaid. Otherrecent satellite launches spotlighted by Mamiya included a satellite forweather forecasting and air traffic control; Japan's first infrared imagingsatellite, Akari, that has already completed its first scan of the entire sky,as well as Hinode - a solarphysics spacecraft undertaken cooperatively with the United States, Europe,and the United Kingdom. Aparticular focus of JAXA is developing a disaster management support system. Mamiyapointed out that Earth is a place of catastrophic natural events that occuralmost every day, be it wild fires, floods or other disasters, that lead to theloss of human life and property. "Totackle this problem for our civilization is to use space technologies," Mamiyaobserved. 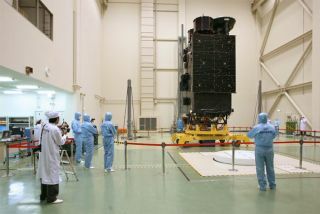 A JAXA initiative in this regard is Sentinel Asia, a rapid responsesystem using satellite data and images. SentinelAsia involves 19 nations and 52 establishments to establish a disastermanagement system that is user-friendly to help combat natural disaster, Mamiyaadded. Inthe area of space exploration, Mamiya said that JAXA is drawing from a lineageof solar system probe launches starting back in 1985. Upcoming is the highly anticipatedliftoff of Selene - a huge, 3-ton spacecraft designed to orbit the Moon. "Seleneis the largest and most sophisticated lunar mission since Apollo," Mamiyareported, and is being readied for sendoff this summer. Orbiting the Moon for anominal 10 months, Selene is loaded with science gear "which should enrich ourknowledge about the origin and evolution of the Moon." Mamiyasaid that JAXA space planners are also working on a Selene 2 for 2012 and aSelene X in 2017. JAXA'sroad map in space exploration also includes the Planet C mission to Venus in2010; a Hayabusa 2 asteroid sample return in 2011, a Mercury orbiter in 2013;and dispatching a probe to Jupiter. "Spaceis a common frontier for humanity," Mamiya explained, and "internationalcooperation is essential." In this regard, JAXA is prepared to be a majorplayer in the replanting of human footprints on the Moon. Mamiyasaid that there is worldwide interest in the Moon. Last month in Kyoto, hesaid, a multi-nation workshop was held to help hammer out a global explorationstrategy for future lunar exploration. "Wewill make a significant contribution to the international lunar architecture,"Mamiya added, activity that he envisions will lead to placing Japaneseastronauts on the lunar surface in collaboration with other space partners.